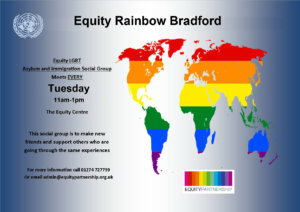 Equity Partnership receives funding from Bradford Council’s Department of Health. Provide information and advice on stopping smoking, healthy eating, and increasing physical activity. Provide screening for Chlamydia, Hepatitis B and HIV. Deliver activities relating to healthy eating, weight management, and physical activity. Deliver training to promote the needs of LGB&T communities. Update and distribute our publication ‘How to Work Positively with LGB&T Communities’ to health professionals. Develop appropriate resources on how to work positively with Trans people. Ensure the needs of LGB&T communities are represented at equality forums/meetings. Launch an Equality Index for Trans work. Equity Partnership has conducted health needs assessments in partnership with our priority groups, and these are publicly available. The Equity Centre provides a safe space for peer support groups to meet. We recognise the importance of peer support in promoting well-being and reducing isolation.